As if completely engulfed in flames. We know that carbon dioxide is in the air, but what we had not seen before was that presence al around the world. 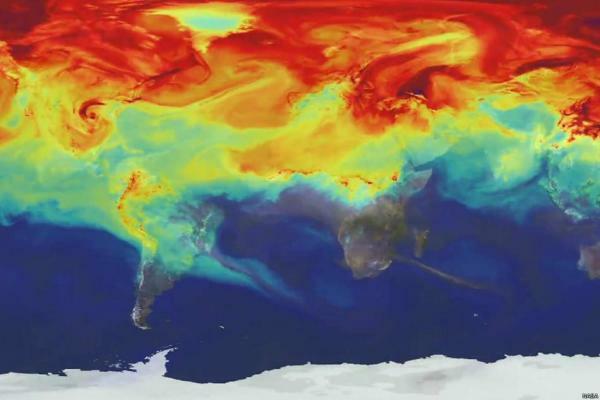 NASA has released these images in which they show CO2’s passage through the atmosphere for twelve months. Specifically in the whole 2006. And one thing they make clear: that most of the pollution comes from the northern hemisphere, densely populated and industrialized. Here’s how the northern hemisphere looks in a new animation by NASA in which they summarize in a few minutes the cycle of greenhouse gases over a year. About half the carbon dioxide emitted by burning fossil fuels remains in the atmosphere, while the other half is absorbed by plants and oceans. In the model created by supercomputers at the US space agency you can clearly see the distribution of CO2, concentrated mainly in North America, Europe and Asia. Also you can see how gases are not kept in just a single place, but rather they are dispersed by the action of weather patterns in the global circulation. As part of the cyclical pattern, the presence of polluting gases decreases during the spring and summer in the northern hemisphere, because plants absorb a substantial amount of CO2 through photosynthesis. Although these changes are predictable, every year more elevated CO2 concentrations in the atmosphere can be observed, according to what NASA explains. This increase contributes to rising global temperatures.